Home » Blog » CAREGIVING » STORIES » Our Life – Updates From T.D.A.C. Our Life – Updates From T.D.A.C. It’s been quite a while since I’ve done an update post so I thought I would take today and fill you in on all of the crazy going on around here. We’ve just returned from a long weekend in KY and had a great time. My husband’s family had a reunion and we had another reunion of sorts with our friends. It’s always nice to catch up with everyone face to face vs. Facebook. The babies are growing up like weeds and starting to say things that are remotely recognizable. Things like Papaw and mammaw, cup and of course, the always popular, “No!” They are 19 months old now and I can’t believe how far they’ve come in such a short time. From 2.1 and 2.5lbs to 22 & 25 lbs respectively. Their personalities are changing as quickly as their little bodies and it’s such a kick to see glimpses of the people that they will eventually become. I never understood the pull of a grandchild until I had my own. When you raise your children as a momma you would kill to protect your children. When grandchildren come along you would kill those same children over those grandbabies any day. It’s amazing how quickly they grab ahold of your heart and hold on for dear life. My niece is here for the summer (the reason we went to KY) and we’re excited to have her with us again finally. She stays every summer and Christmas break with us. You may remember her guest post back in 2014. There are some big changes coming up for our family. The first and most important is the fact that we will soon be moving. We haven’t found the right place yet and we’ve only just begun to look, but I’m confident we will be able to find the perfect house to fit all of our needs. We thought that we would be staying here longer than we will, but circumstances change and the owner no longer wants to own so he’s selling. We aren’t interested in home ownership again at this point in our lives. My husband only has a few more years until retirement age and we’re not sure where our forever home may be if anywhere. Traveling well into our senior years has always been the plan. We don’t want to be tied down to a piece of property that we no longer want. So we’ll find the perfect rental and try to make the move as easy for momma as we can. I don’t have all of the answers on how to do that just yet, but it’s something that I am striving for. I remember the downward spiral she made when we first moved here and I’m in no hurry to go back down that road again. Moving for someone with Alzheimer’s is a terrifying experience, to say the least, and the easier I can make it for her the better. We’re lucky in the fact that we are able to pick and choose until we find the place that will make us happy. We love this house we’re in now and we’ve had a lot of good memories over the last four years, but my husband and I both feel that it is time to move on. We want somewhere safe for momma to take her walks, we want plenty of room to move around (preferably a 4 bedroom since I need an office space desperately), and I would also like to have a pool. The pool isn’t a make or break deal but if I am listing all of the things I want then I have to add in a swimming pool. I love to swim and would do it every day if I could. Here I go to the lake which is only about a half mile away. The benefits to my body and my RA make it something more than just a want and sticks it pretty close to the “I need” column. Being able to jump in a pool when my bones get so stiff and sore would be amazing to me. Maybe that perfect home is just out there waiting for us. I know we won’t have a problem finding the right place. We are every landlord’s dream. We want a long-term lease, we don’t have kids or pets, and we have always left a place looking better than it did on move in day. We have excellent references. So, I’m not worried at all and I’ve been guaranteed a 4-month window if it does sell. Last but not least, we’re getting set to do another Walk To End Alzheimer’s and in the next couple of weeks I’ll start my annual pitch to donate to our team for the walk. I’ll let you know when that gets a little closer. I’m getting ready to do another redesign here at TDAC. I get bored easily so seeing the same site day after day grates on my nerves and after a while, I have to attempt something different. I’m already working on the new logo and wireframe so it won’t be long before we get another whole new look. I have some wonderful guests posts on incontinence coming up next week and Friday is this month’s Use Your Words post where we are each given some random words and we then craft a story from those words. There are 14 bloggers that take part and if you are interested in joining us then contact Karen over at Baking In A Tornado. It’s a lot of fun and she has several creative writing challenges to choose from! No wonder why I lost track of you! Wow, you’re a busy girl, and all good stuff. The grandbabies have grown – I only remember their newborn photos. Wow. About renting and all the rest, after having our house on the market for 2 years I have to hold out hope that all will eventually fall into place. My cousin moved his mom (also my cousin!) clear across country when he decided to move. Of course it was a little easier for him than most people b/c they have $$ so he hired a nurse to fly with them. The plane ride was a disaster, especially when she had to use the bathroom. I won’t go there. Eventually everyone settled in and was happy in their new digs. Hit me up for a Walk donation at roswarrenATgmail.com when you start raising $$. I work at a public library so I’ll only be able to kick in $20, but Im happy to do that. LOVE the line about killing your kids for the sake of those grandbabies. (I’m not a grandma yet, but I’m looking forward to it.) I also want to support your desire to swim every day. I’m lucky enough to have a sister with an indoor pool who lives in my neighborhood. (It’s one of those Endless Pools where you swim against the current.) So I get to swim EVERY DAY. And it’s just wonderful for my health and spirit. (And I can swim at our outdoor community pool all summer at the incredibly cheapo rate.) So definitely — seek out that pool. Daily swimming will change your life. What cute kids. Best of luck with the move, that sort of thing is always stressful. I didn’t know you had RA. So do I. What meds do you take? Grandbabies, oh how I can relate. Mine are the joy of my life and when they leave I miss them like crazy. Kathy @ SMART Living 365.com recently posted…Is Cohousing The Best Solution To Aging Well? Thank you so much Kathy. Things seem to moving a lot faster than I had anticipated. I’ll tell you all about it on Friday. So much fun and excitement. Those babies are gorgeous, love that you have your niece back, I’m so proud of all you’ve done with The Blogging 911. I didn’t know you were going to have to move, I hope the move goes well. Oh yes, Karen I gotta fill you in! I’ll email you. I totally understand the idea of not being tied down to a piece of property. We downsized into a mobile home and love it. No maintenance. It makes it so much easier to travel and not nearly as expensive. Thank you Jasmine. Luckily, they don’t have to go through it other than adjusting to a new space to spend their Friday nights with mamaw and papaw. Such adorable Kiddies! I love that you are supporting great causes like Walk To End Alzheimer’s! Thank you for that. Thank you Kari for your kind words. I am so sorry you have to go through this. Finding a spot this safe for someone with a medical issue can be hard. I hope you can find the right home and it goes smooth for you. Lots of changes. I know exactly what you mean about grandchildren. They open your heart to a love you never knew you had! Wishing you much success as you find your new home WITH A POOL! I cannot believe those lil miracles are already 19months old and talking and you are so right, grandkids are heart stealers. Great to see you! Glad things are going so well for you both personally and in the blogosphere. Good luck with the move! 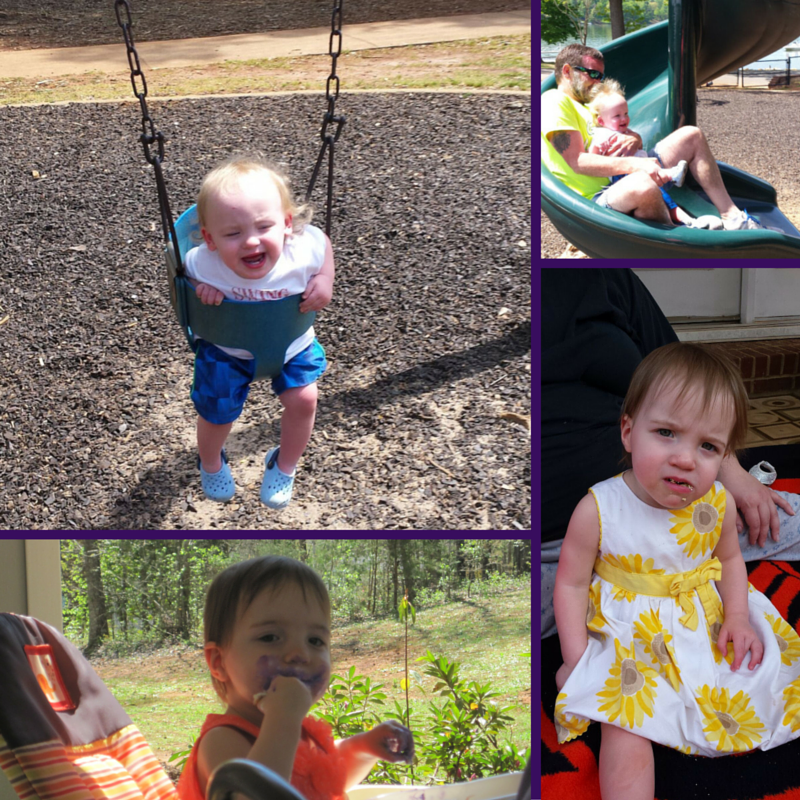 So glad to read an update on your life Rena – your grandbabies are the cutest things ever! I’m so sorry I’ve been out of the loop – I miss talking to you. I can’t believe how big your babies are getting! I still remember them with their little oxygen masks. Miracles, both of them! Wow! Moving. You, girl are one brave lady! I’ve done it too many times myself, but never with RA and with your sweet Alzheimers sufferer in tow. You are always so upbeat about everything, it is always a pleasure to read your posts. I have a hard time finding all of my favourite bloggers since the Midlife site was taken down. I’m so glad I thought to subscribe! Great pics! Love their dandelion heads of hair! Please email me when you do your walk so I don’t miss the opportunity to support you. My next month is going to be out-of-control and I might not be online as much. Email is mithraatthebubblejoy.com. The twins are growing so quickly! Good luck in the house hunting. My dream is to have an indoor lap pool with a maintenance person. As you look at those grandbabies now, it is hard to believe how terrifying it was when they were born. But you maintained the right attitude and knew they would be fine and LOOK at them NOW. I was glad to hear that your Blogging 101 is doing well. I took a look at your creation at Courting Destiny – nicely done. I know that when the time comes for the move, you will have the grace and patience needed to help Momma through the change. Andrea recently posted…What Are You Thanking God For This Week? my daughters love the park, always a good time for everyone.